Sri Lanka, in their chase, got bowled out for 251. On 13th November 2014, Rohit Sharma scaled a new height in One-day cricket by scoring his second double century in the format at Eden Gardens in Kolkata against Sri Lanka. Sharma’s first double century came against Australia at the Chinnaswamy Stadium in Bangalore in 2013. The innings of 264 remains as the highest individual score in ODIs till date. The right-hander’s historic innings came to an end on the last ball of the innings with his score at 264. According to many experts, Rohit Sharma’s record of 264 would be one of the many unbreakable records in the history of cricket. The 31-year old’s innings included 33 fours and 9 sixes, mercilessly taking apart the Sri Lankan bowling attack. India, electing to bat in the 4th ODI, had already locked the series to their name. India had already put up a splendid batting performance in the first three ODIs, putting a score in excess of 350 in the first and chasing in a terrific manner in the next two. 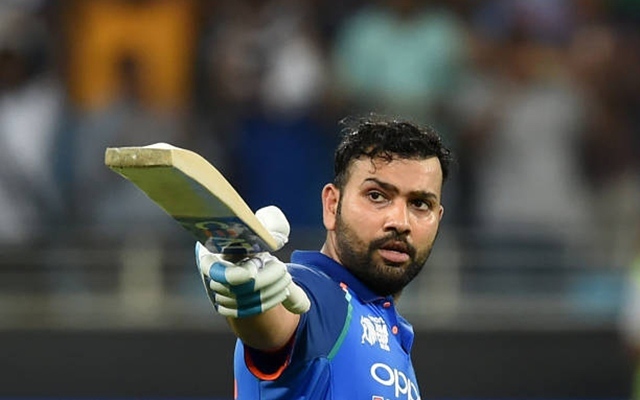 Rohit Sharma had the luck on his side when he was dropped by Thisara Perera while batting on 4, having played 16 balls. From there on, he was unstoppable. He got to 50 off 72 balls, 100 off 100, 150 off 125, 200 off 151, and 250 off 166. He surpassed his fellow countryman’s score of 219 by Virender Sehwag with a maximum in the 2nd ball of the 46th over and crossed the 250-mark with a boundary in the second ball of the 48th over. Sri Lanka were given a target of 405 to chase down, courtesy of Rohit Sharma’s brilliant double century and Virat Kohli’s flawless half-century. Sri Lanka, in their chase, got bowled out for 251, falling short by 13 runs off Rohit Sharma’s individual score. Undeniably, Sharma’s promotion to the top of the order turned his career entirely upside down and also did wonders for the team. Since the time he has been opening the innings in ODIs, the Mumbai batsman has scored 5487 runs at a healthy average of just above 58. While batting at number 5, he has yielded 862 out of the 7454 runs that he has amassed in 193 One-day fixtures. Out of the 21 hundreds, 19 of them have come while batting in the opening position. India’s top three including Rohit Sharma, Shikhar Dhawan, and Virat Kohli have been outstanding in the last few years and it will be interesting to see how they fare in the upcoming World Cup since they largely hold the key to India’s hopes in the batting department.